Hartford, Connecticut, May 23, 2018—Excellence in faculty research and scholarship was on display at the 21st annual Shirley G. Wassong Memorial Lecture in European and American Art, Culture, and History at Trinity College on April 23. 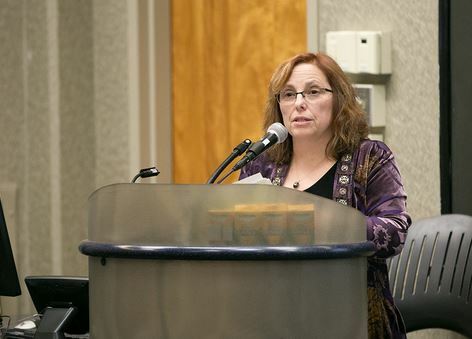 This year’s presenter, Cheryl Greenberg, Paul E. Raether Distinguished Professor of History, traced the political collaborations between black American and Jewish American organizations during the 20th century on issues of civil rights and civil liberties, as well as their tensions and struggles. Her research works to draw lessons from this narrative, determining what worked and what did not in this powerful coalition. Johannes Evelein, professor of language and culture studies, chair of German studies, and co-director of the Trinity Institute for Interdisciplinary Studies (TIIS), introduced Greenberg by expressing her commitment to Trinity, her long-standing scholarship, and her capacity to enlighten even her fellow faculty members through her contributions to her field. 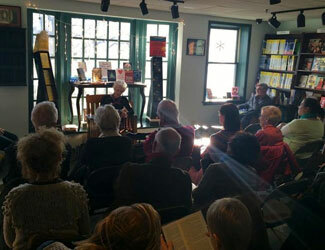 Greenberg brought her unique perspective to what was both a historical exploration of engagement with the civil rights movement and a political primer for coalition building today. Greenberg’s work underscores the richness of an interdisciplinary approach to complex historical topics and the breadth of study that is happening on Trinity’s campus. ​Cheryl Greenberg, Paul E. Raether Distinguished Professor of History, delivers the 21st annual Shirley G. Wassong Memorial Lecture in European and American Art, Culture, and History at Trinity College on April 23. Greenberg began with the pronouncement that she would be “violating every rule in the historical profession by using the past in service of the present.” Throughout her presentation, she gave insight into the methods employed in black and Jewish communities as they sought to improve their circumstances in American society. At key times in the 20th century, Greenberg explained, black and Jewish people moved forward together, spurred by a mutual self-interest that benefited from collaboration. While there was nothing special about both being minority groups, Greenberg argued, they did have some shared experiences to draw from while working together. At the turn of the 20th century, the coincidence of the Great Migration of African Americans to the North and the arrival of millions of Jews from Europe meant that American cities had new populations to consider. Both black and Jewish groups formed organizations to help meet their own needs in this landscape. Later, they would seek the support of one another, with the Jewish community reaching out for support during the crises in Europe, and black Americans seeking to make strides in civil rights following decades of oppression. For both groups, it was about “rearticulating their agenda in a more universalist way” to ensure they reached a broader audience in their organizing. Greenberg asserted that contemporary activists can look to the past to understand how to collaborate to support mutual interests. “We must work to dismantle those invisible barriers—changing individual hearts and minds is not enough … discussion is not enough,” she said. This resounds in an age of new protests, causes, and challenges to connect seemingly disparate communities. The lecture was preceded by the annual dinner and reception, attended by students, staff, faculty, alumni, and members of the public. The Shirley G. Wassong Memorial Lecture was established in 1996 in loving memory of Mrs. Wassong with the support of friends, family, and her husband, Joseph Wassong ’59. Since 2010, the Trinity Institute for Interdisciplinary Studies has been honored to organize this annual event. Hartford, Connecticut, May 1, 2018—The tradition of the Allan K. Smith and Gwendolyn Miles Smith Lecture continued on April 17 with a presentation to a nearly full McCook Auditorium from Hilary E. Wyss, Allan K. Smith and Gwendolyn Miles Smith Professor of English. Her lecture, “This Native Place: Joseph Johnson and the Writerly World of 18th-Century Indigenous Connecticut,” focused on Johnson’s life and his connection to writing and literature as a Native American. Hilary E. Wyss, Allan K. Smith and Gwendolyn Miles Smith Professor of English, delivers a lecture at Trinity College. Photo by John Marinelli. Wyss suggested that New England’s past is commonly seen as a history of English settlements established and expanded, colonial wars fought and won, and indigenous people tragically displaced. However, she said, there’s a different story, one written by Native people and bound by indigenous ways of seeing and knowing the world. From the beginning of her discussion, Wyss reminded the audience that “this is a Connecticut story,” showing the intimate connection between Joseph Johnson’s life and New England history. With settings including Farmington, New London, Stonington, and Hartford, Wyss underscored how the Connecticut landscape fit into Johnson’s early American life and how our own modern lives are “immersed in Native spaces.” She argued that indigenous people, now and in Johnson’s time, “are not tragic people left behind by modernity,” but instead a community that deftly navigated the complexities of white hegemony in their native land. Wyss showed how Johnson maintained his indigenous identity in spite of the formal, Calvinist education that he received at Moor’s Charity School under Eleazar Wheelock, for whom discipline, order, and obedience shaped education. According to Wyss, Johnson used his mastery of writing and rhetoric to reconcile seemingly disparate parts of himself—the educated Christian and the Native Mohegan community leader. His writing became a vehicle for self-acceptance in a Native community of Christians, who came to interpret Christianity from Native leaders instead of through people like Wheelock. As Johnson grew in his mastery of writing, “He acquires his authority and confidence through his own work in relation to his own Indian brethren,” Wyss said. She argued that Johnson used Christianity to maintain connection to the indigenous community. One of the most fascinating aspects of Wyss’s study is rooted in her consideration of handwriting as an aspect of Johnson’s identity. Many in the eighteenth-century believed that “character could be formed and shaped, like handwriting, into a neatly ordered identity.” While there are no portraits of Johnson to tell us what he looked like, Wyss used several examples of his handwriting to help the audience develop an image of him. In one draft, his writing is that of the straight-lined, controlled, conforming citizen. In another composition, not intended for public view, his sprawling hand bounced with another rhythm, taking new shapes and rendering Johnson as uninhibited, rejoicing in his own accomplishments through his mastery of language. Although just 25 years old at his death, Johnson was instrumental in working with his father-in-law, Samuel Occom, to create Brothertown, a community of Christian Indians. He would use his rhetorical skills to solicit support of Brothertown with “writing-supplemented oratory” that supported the tradition of the spoken word and used Christianity as a radical political stance to help bind an indigenous community together. As Wyss unpacked the consequences of Johnson’s work, she implored the audience to reconsider the very definition of early American literature. “English departments at colleges like Trinity are invested in the written word and challenged: What is it that we consider literature?” Wyss suggested that if we challenge our assumptions and reevaluate texts from writers such as Johnson, we can enrich our perspective of indigenous life and early American life as a whole. Hilary E. Wyss teaches courses in early American literature, American studies, and Native American studies at Trinity. She is the author or editor of more than a dozen articles and three books: English Letters and Indian Literacies: Reading, Writing, and New England Missionary Schools, 1750–1830 (2012); Writing Indians: Literacy, Christianity, and Native Community in Early America (2000); and with Kristina Bross, Early Native Literacies in New England: A Documentary and Critical Anthology (2008). She served as president of the Society of Early Americanists from 2011 to 2013 and has been on the editorial board of the journals Early American Literature and Studies in Eighteenth-Century Culture. 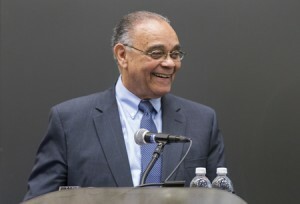 The Allan K. Smith and Gwendolyn Miles Smith Professorship of English was endowed by a generous bequest of Allan K. Smith, a member of the Class of 1911 and a 1968 honorary degree recipient, of West Hartford, Connecticut. The fund also supports added faculty positions, salaries, and other materials to improve the curriculum. Devoted benefactors to the college, the Smiths established five endowed funds at Trinity to support academics, including the Allan K. Smith Center for Writing and Rhetoric and the work of the English Department. In 1990, the Smith House located on Trinity’s campus was named in honor of the Smiths, and Mrs. Smith received an honorary degree from the college that same year. Emily Mitchell-Eaton, Patricia C. and Charles H. McGill III ’63 Visiting Assistant Professor of International Studies, delivers her lecture. Photo by John Marinelli. The Marshall Islands, a series of atolls and islands in Micronesia, was occupied by the United States after World War II and used for extensive nuclear weapons testing during the Cold War. This testing, combined with the U.S. military presence there, displaced many Marshallese and drastically impacted the health of multiple generations exposed to radiation. Marshall Islander migration to the United States soared in the mid-1980s in response to an international agreement between the United States and the Republic of the Marshall Islands, a former U.S. territory. While the agreement marked the formal end of the colonization over the islands, the U.S. military remained. The 1986 Compact of Free Association (COFA) allowed Marshallese to come to the United States—without a visa—to live, work, and receive education. This created a Marshallese migration whose largest resettlement site is now Springdale, Arkansas. Once a nearly all-white town and remote unto itself, Springdale became a “destination of empire” not only for Marshallese but also for Latinx immigrants, changing the demographic landscape of this small Southern town. Mitchell-Eaton’s exploration of the Marshallese community came from 55 interviews between 2011 and 2014 and archival research, talking to Marshallese residents, Springdale’s law enforcement and policy officials, social service providers, and immigrant rights activists. Mitchell-Eaton explored the effects that living in this “precarious and exceptional” space can have on the resources Marshallese can access, particularly housing, employment, education, and health care. She affirmed that there is “lack of awareness of the U.S. global role as an empire and lack of understanding of COFA status” that “… has dramatic and sometimes violent effects for COFA holders.” Their position in Arkansas, in what itself is considered a remote area of the United States, continues to alter the idea of what it means to be transnational—and relates to the similar precarious legal statuses of other imperial relationships, such as those with Puerto Rico, Guam, and parts of the Caribbean. In describing the visiting professor’s work, Associate Professor of History and International Studies Zayde Antrim noted that Mitchell-Eaton “challenges us to think of ‘here’ and ‘there’ ” and to rethink “ ‘out there’ as ‘here.’ ” Bringing us closer to “here,” Mitchell-Eaton closed her talk by relating the story of the Marshall Islands with an issue that is geographically much closer to Trinity—the circumstances of Puerto Ricans displaced to Hartford because of Hurricane Maria. Mitchell-Eaton argues that we “must resolve and pay attention to the state of these groups” and in doing so address the imperial legacy of the United States. As climate change looms, the possibility remains that one day the Marshall Islands will no longer be inhabitable. With this, Mitchell-Eaton asked with a note of irony, “Will Springdale, Arkansas, become the new capital of the Marshall Islands?” Her question highlights the reality that the Marshallese are at risk in multiple ways—not only precarious in their presence in the United States but also in their position as citizens of their own country. Mitchell-Eaton’s lecture was followed by the annual reception and dinner, which was attended by members of Trinity’s faculty, staff, and students as well as guests from outside of the college community. The McGill International Studies Fund was established in 1996 with a gift from Patricia C. and Charles H. McGill III ’63. 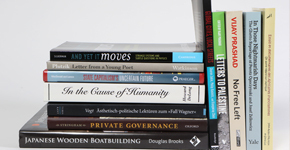 The gift helped secure a matching grant from the National Endowment for the Humanities. The income from the fund is to be used to support the appointment of visiting humanities scholars, primarily international scholars, in the academic areas of international studies that include African studies, Asian studies, Caribbean and Latin American studies, Middle East studies, global studies, and Russian and Eurasian studies. Charles H. McGill III ’63 is a nationally recognized expert in mergers and acquisitions, as well as corporate strategic planning and restructuring, with significant experience in consumer products, restaurant and food service, and information services. McGill is the founding partner of Sagamore Partners, an acquisitions adviser. Previously, he was a senior executive of Fortune Brands, Dun & Bradstreet, and the Pillsbury Company. McGill is a former member of the Trinity College Board of Trustees and its Board of Fellows. He received the college’s Alumni Medal for Excellence in 1993. The McGills are the parents of a 1994 Trinity graduate. Leslie Desmangles delivers the annual Shirley G. Wassong Memorial Lecture in McCook Auditorium at Trinity College. Photo by John Marinelli. 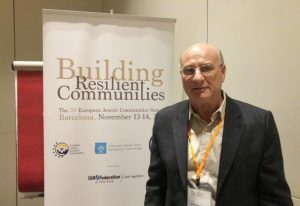 While many people are familiar with the persecution of Jews by the Nazis during the 1930s and 1940s, fewer know about the cruelty and oppression Jews faced in 15th century Spain and later in Portugal. During a Catholic Inquisition that lasted for centuries, thousands of Jews were burned at the stake or imprisoned. This prompted many Jews and conversos ― those who practiced their faith in secret ― to flee to the Caribbean in search of personal safety and greater economic opportunity. On April 25, Leslie Desmangles, Trinity College professor of religion and international studies, traced the migration of Sephardic Jews in Spain, Portugal, and other parts of Europe to the Spanish colonies of the New World as he delivered the 19th annual Shirley G. Wassong Memorial Lecture in European and American Art, Culture, and History on campus. Desmangles described the changing fortunes of European Jews in their new home. In the lush beauty of Brazil and the Caribbean islands, Jewish settlers initially thrived, becoming involved in the sugar trade and building modest synagogues. Historical records reveal that they preserved their cherished religious traditions, including weekly worship. Dutch colonies such as Curaçao not only welcomed Jews but also recognized them as citizens while requiring them to farm the land. Many Jews became active in import-export businesses, while others became influential politicians, plantation owners, and bankers. By the end of the 17th century, their riches allowed them to pay off the mortgages of synagogues in the Caribbean, New York, South Carolina, and Rhode Island. But as certain territories changed hands over the years, Jews once again became the target of religious persecution, which curtailed their ability to own land and conduct business and forced many to conceal their faith. In 1685, France ordered the expulsion of all Jews from French colonies. Desmangles likened Jewish settlers’ nomadic movement among the sandy islands, in a quest for safer havens, to the biblical story of Jews wandering in the desert. While Jewish congregations continue to flourish on some islands to this day, much of the Caribbean’s once-thriving population has disappeared over the past 50 years, due in part to interfaith marriages, erosion of customs, and the out-migration of young people. “Jewish children go abroad to study and don’t come back,” Desmangles said. Immediately following the lecture, Trinity College President Joanne Berger-Sweeney took the podium with Dario Euraque, Trinity professor of history and international studies, and Vijay Prashad, George and Martha Kellner Chair in South Asian History and professor of international studies at Trinity, to make two announcements. The first was of a new Honors Day award: the Leslie Desmangles Prize in Caribbean Studies. The second was that Desmangles ― co-founder of the Haitian Studies Association and founder of the Journal of Haitian Studies ― would be the first director of the College’s new Center for Caribbean Studies, to be launched in November 2016. The Shirley G. Wassong Memorial Lecture Fund, which supports an annual lecture on the themes of European and American art, culture, and history, was established in 1996 in loving memory of Shirley Wassong by friends, family, and her husband, Joseph F. Wassong, Jr. Trinity Class of ’59. The annual lecture features members of Trinity’s faculty and guest scholars in alternating years. The lecturers are from various academic disciplines, and their topics range from antiquity to the present day. This year’s event marks the 19th Wassong Memorial Lecture. Writer-in-residence Lucy Ferriss will open the Trinity College English Department’s Fall 2015 Allan K. Smith Reading Series on Wednesday, September 16, at 4:30 p.m. at the Smith House (123 Vernon Street). Asked about the upcoming A.K. 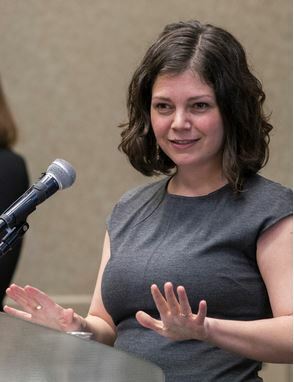 Smith series event, Ferriss said, “I’m excited to be reading on the campus that inspired the story.” While on sabbatical last semester, Ferriss spent much of her time traveling around the U.S. for readings and appearances at bookstores, libraries, and writers’ conferences. 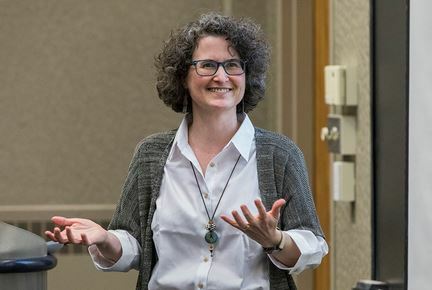 Among her presentations was one titled “Love, Honor, and Squash: Field Research for Fiction,” for alumni attending Trinity’s Reunion in June, in which she detailed how her research for the book took her from Trinity’s own squash courts to the remote Pashtun villages of Pakistan. As Ferriss shared in a recent New England Public Radio interview about A Sister to Honor, the concept of honor, both throughout the world of sports and among different cultures, is a significant theme of the novel. A faculty member at Trinity since 2000, Ferriss teaches courses in fiction writing, contemporary American literature, narrative theory, and Native American literature and culture. She writes regularly for The Chronicle of Higher Education’s Lingua Franca blog. Ferriss received a B.A. from Pomona College, M.A. degrees from San Francisco State University and Tufts University, and holds a Ph.D. from Tufts. Other writers in the Allan K. Smith Reading Series will be poet David Baker on October 1; novelist Jim Shepard ’78 on October 21; author Heidi Julavits on November 18; and poet Kimiko Hahn on December 10. All readings are free and open to the public. A reception and book signing will follow each event. 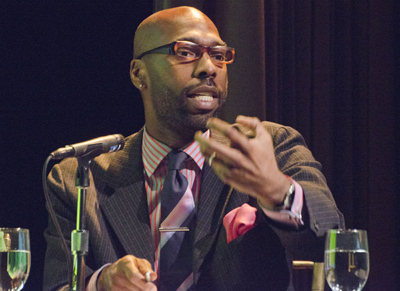 Davarian Baldwin during a February panel discussion at the Wadsworth Atheneum. When Davarian Baldwin, Paul E. Raether Distinguished Professor of American Studies, joined Trinity’s faculty in 2009, he saw the tremendous value of the College’s Hartford location as a source of scholarship and as an ideal setting for a liberal arts education. In the years since, Baldwin has made good on that goal, leaving his mark both on Hartford and on urban landscapes throughout the country. His scholarship is vast, including such subjects as the civil rights movement, the role of African Americans in shaping American culture, and urban institutions of higher education. Baldwin’s scholarship is on display not just in Hartford, but around the country. Baldwin’s expertise was featured by USA Today in a recent story about the Harlem Renaissance. The Hartford Courant turned to Baldwin to address the role of social media following protests in Ferguson, Missouri. A recent podcast from the New York Public Library’s Schomburg Center for Research in Black Culture featured Baldwin and his theory of “UniverCities.” Also at the Schomburg Center, he was part of a discussion about the role of slavery in the development of institutions of higher education and how those institutions are transforming urban America today. Among the institutions Baldwin has examined are the University of Chicago, New York University, Arizona State University, and – of course – Trinity. And his scholarship has not been restricted to American audiences; on April 9-10, Baldwin will be in Shanghai, China, to present on “University-Community Relations in the Urban U.S.” at the City and Society International Forum at Tongii University. “There’s no question that being here and having the support of Trinity’s leadership has helped make this possible,” he said. 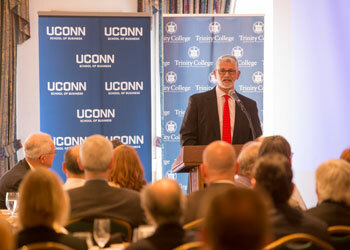 Paul Assaiante, Trinity College’s men’s squash and tennis coach, author, and motivational speaker, was the featured speaker at the annual Bradley, Foster & Sargent luncheon at the Hartford Club on May 7. This was the sixth year that Hartford-based investment advisory firm Bradley, Foster & Sargent has sponsored an annual luncheon and lecture in partnership with Trinity College and the University of Connecticut School of Business. Each year, a featured speaker addresses a topic of interest to the local business and finance community, and the audience includes students from Trinity and the UConn School of Business who have participated in Bradley, Foster & Sargent’s internship program. This year’s luncheon was attended by a crowd of more than 200. In his talk, “Coaching to Overcome Fear,” Assaiante shared lessons from his years of building and coaching teams of champions at Trinity − lessons that pertain equally well for leaders striving to encourage daily effort and focus under pressure with teams in the business realm. He also let the crowd in on the news that his book, Run to the Roar: Coaching to Overcome Fear, will be made into a movie, though casting has not yet taken place. Assaiante, who has been the coach of the U.S. national squash team as well as the U.S. Olympic Coach of the Year, talked about his infectious passion for squash, his successful coaching philosophy (face your fears head-on), and how he recruits talented young men from around the world, molds them into a team, and drives them to achieve unparalleled success. As head coach of Trinity’s men’s squash team, Assaiante led the team to its 19th consecutive College Squash Association National Championship this year, where they won their 15th national title. The team holds the longest winning streak of any college team in any sport in history under Assaiante’s leadership: 13 consecutive NCAA national titles and 252 consecutive match victories. His men’s tennis teams have consistently been ranked both regionally and nationally. Assaiante said he is concerned about the new millennials. “We’re not letting our kids fail enough, not giving them enough ownership over their journey.” But he said that workplace internships, such as the ones students in the audience have participated in with Bradley, Foster & Sargent, go a long way toward providing college students with the real life lessons they need to experience. A member of the Trinity College faculty since 1994, Assaiante’s early career included coaching squash and tennis at the U.S. Military Academy at West Point and the Princeton Club of New York. He is a graduate of Springfield College with a master’s degree from Long Island University. 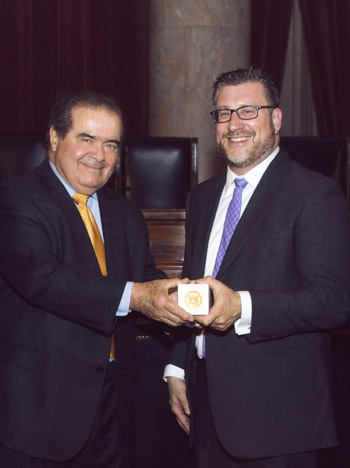 Justice Antonin Scalia presents Kevin McMahon with the Griswold Prize. Recently, two faculty members at Trinity delivered addresses to the United States and Connecticut Supreme Courts. Though their talks were just one day apart, the topics they discussed spanned almost eight centuries. In Washington, D.C., on April 30, Kevin McMahon, John R. Reitemeyer Professor of Political Science, accepted the Griswold Prize for his 2011 book, Nixon’s Court: His Challenge to Judicial Liberalism and Its Political Consequences. After an introduction by Justice Antonin Scalia, McMahon spoke on that same topic. 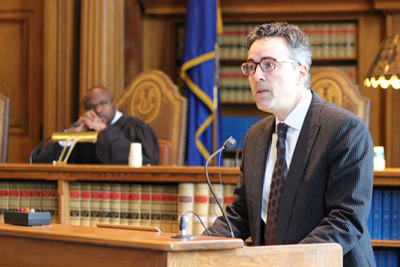 The next day in Hartford, Jonathan Elukin, associate professor of history, was invited to address the justices and guests of the Connecticut Supreme Court for Law Day. His keynote address on the Magna Carta, the theme of 2015’s Law Day, marked that document’s 800th anniversary. The program was broadcast on CT-N.
McMahon’s book was selected for the Griswold Prize in October 2014, the first time since 2009 that a book merited the prestigious award. Many scholars have held that President Richard Nixon failed in his efforts to challenge the liberal approach of the Warren court. In Nixon’s Court, McMahon maintains that Nixon’s strategy was in fact a success from both a legal and political perspective. He argues that Nixon was able to earn the Supreme Court’s endorsement of his highest priorities while simultaneously laying the foundation of an electoral alliance that would dominate presidential politics for a generation. His remarks at the Supreme Court were featured by the high-profile SCOTUSblog. Connecticut Supreme Court Justice Richard A. Robinson looks on as Jonathan Elukin delivers a keynote address on the Magna Carta. ​Connecticut Chief Justice Chase T. Rogers introduced Elukin and spoke of the importance of increasing access to justice. She called the Magna Carta a foundational document that shaped many of today’s legal principles. In his remarks, Elukin discussed how that came to be, originating as a relatively narrow agreement and evolving into a timeless contribution to legal and political thought. Elukin focused not only on the history of the Magna Carta, but also its relevance today, echoing remarks by Chief Justice Rogers. For a scholar of Catalonia and national identity, recent events in Spain have been “the joy of a lifetime,” said Thomas Harrington, associate professor of language and culture studies. As Catalonia has moved toward independence from Spain, Harrington has been a go-to expert for both media and activists in the Catalan region. Meanwhile, he has been a prolific scholar, publishing two books, consulting on a documentary film, and conducting research with colleagues around the world. Harrington’s latest book, The Alchemy of Identity, explores the formation of national identity on the Iberian Peninsula. Earlier in 2014, he released Livin’ la vida barroca: American Culture in an Age of Imperial Orthodoxies. In it, he applies the lessons of Iberia to discourse about nationalism and imperialism in the United States. While obviously impressive, the publication of two books is just a sliver of Harrington’s 2014 scholarly output. Harrington was the subject of several interviews and articles in Catalan media, including El Punt Avui, the Catalan News Agency, Vilaweb, Diari de Prada, La Vanguardia, and the national newspaper Ara. He was also interviewed by the Catalan National Assembly, a group of activists working toward the peaceful separation from Spain. He has been called upon to provide his views on other subjects as well. 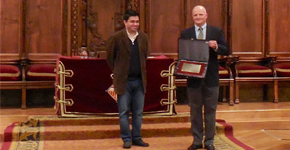 At a conference intended to re-envision the field of Galician studies, Harrington delivered the keynote address. He also assisted in the production of a documentary about Valencian Spanish immigrants to the United States. What is noteworthy about Harrington’s recent work, in addition to its volume, is that it takes place against the backdrop of the Catalan march toward independence. The Alchemy of Identity in particular is a timely release that offers context into a movement that has been under way for centuries but only recently covered by North American media. For Harrington, it has been something of a perfect storm. In an October 2014 non-binding referendum, over 80 percent of those Catalans who voted supported Catalonia becoming an independent state. As Catalan activists work toward separation from Spain, Harrington’s work will continue to take on relevance. With the region’s rich history and exciting present, Harrington’s pace is unlikely to slow.